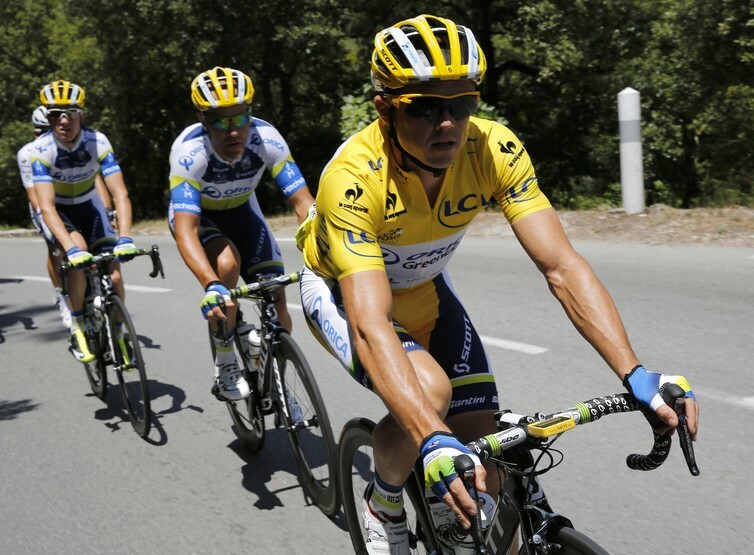 Cyclists in this year’s Tour de France – currently underway – will cover more than 3,300km over 21 stages in 23 days. Of course, due to the extreme physical exertion required to do this at speed, many will not finish at all. But while watching the world’s best battle it out, it’s interesting to consider what is actually happening at the muscular level: where is all that power and speed coming from? The key force behind the Tour is the rotation of the bicycle cranks driven by the force of skeletal muscles. While the major part of this muscular force is produced by the lower limb muscles, the trunk and upper limb muscles are also contributing to the pedalling movement to varying degrees depending on a cyclist’s technique or position on the bike. The contribution of the upper body muscles increases when cyclists move their hands from the brake hoods to the drops, but also when they increase the lateral sway (literally swaying from side to side) while adopting a standing position, as often seen when climbing hills. The force generated by cyclists on the handlebar through their upper limb muscles is transmitted, thus allowing them to increase the force they apply to the pedals. For that reason, cyclists suffering from injuries to their upper limbs after crashes are often forced to withdraw from the Tour. So the cyclists are driven by various combinations of skeletal muscle, but what exactly is skeletal muscle? It’s an organ made up of three components: a contractile component (composed of muscle cells called fibres) and two elastic components (made of collagen) located parallel to the contractile component. The force produced by these muscles is equal to the sum of the tension generated by the three components. In cycling, the elastic components do not contribute significantly to the production of muscle forces, as the muscles are not stretched enough. So, cyclists produce most muscular force from the action of the muscle fibres in the contractile component of their skeletal muscles. Because the muscle fibres produce a maximal amount of tension at a specific length (what’s known as the resting length of the muscle), the choice of the cyclist’s riding position is not only crucial for comfort during the three long weeks of le Tour, but also to determine the capacity of muscles in the lower limbs to generate force during each stage of the pedalling cycle (the full rotation of the pedals, with its various phases). In simple terms, the length of the different muscles is going to vary as the angles of the joints they cross change while the bicycle crank is rotating. Mastering a bicycle to produce maximum power output, as elite cyclists must, is also a balancing act between the two types of muscle fibres: slow-twitch (Type I) muscle fibres and fast-twitch (Type II) muscle fibres. Slow-twitch fibres contract slowly, can be used for longer periods of time – ideal for endurance athletes – and rely on oxygen as their main energy source. Fast-twitch fibres contract quickly, provide strength and speed – ideal for sprinting – and fatigue more quickly than slow-twitch fibres. The distribution of these fibres varies between the muscles of different cyclists. We know that the Rectus Femoris (pictured) - one of the four quadricep muscles in the thigh - has a high percentage of fast-twitch muscle fibres while the Soleus – around the calf muscles - has a high percentage of slow-twitch muscle fibres. As mentioned above, the two types of muscles fibres differ in terms of their speed of contraction (the velocity at which they can shorten while generating tension) and their resistance to fatigue (ability to keep producing the same level of tension after repeated contractions). Cycling performance, then, relies on the production of a movement that is cyclical (a repetition of contractions) and can be produced at different [cadences](http://en.wikipedia.org/wiki/Cadence_(cycling), generally expressed as the number of crank revolutions per minute, depending on the gear selected by the cyclists to produce a given power output. Fast-twitch fibres can shorten twice as quickly as slow-twitch fibres while generating the same tension, so cyclists with a high percentage of fast-twitch muscle fibres in their lower limb muscles will be able to produce more power, and at higher cadences. The power they’re able to generate will also depend on the size of the muscles. Sprinters have a higher percentage of fast-twitch muscle fibres and larger muscle volumes. 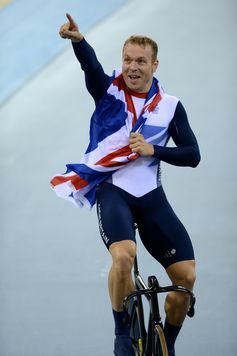 Because the quadricep femoris muscles produce a large part of the power during sprint cycling, sprinters display big thighs (but not to the same degree as track sprint cyclists, such as Scotland’s Sir Chris Hoy, pictured). But having big muscles packed with fast-twitch muscle fibres is not very helpful when it comes to the mountain stages, simply because the performance of these muscle fibres are pretty bad when it comes to resistance to fatigue and fuel efficiency. When you need to ride for long hours at a “moderate” intensity - around 200W - having smaller muscles filled with (slow-twitch) muscle fibres that offer the best efficiency (which can be simply defined as the ratio between mechanical work produced and energy expenditure) is more important. In line with this, some studies have observed that cyclists with a high percentage of slow-twitch muscle fibres in their quadriceps show a better efficiency on the bike. The results of studies performed on monozygous (identical) and dizygous twins show that muscle fibre composition is mostly determined by genes. But some improvement of efficiency in elite cyclists across their careers was reported, even if the explanation is [still unclear](http://www.ncbi.nlm.nih.gov/pubmed/23493366](http://www.ncbi.nlm.nih.gov/pubmed/23493366 ). This difference in types of muscle fibre from person to person goes a long way in explaining why some cyclists are so strong in sprints and time trials, while others make their mark on the long, steady hill climbs. Fortunately for the sake of competitiveness and sheer spectacle, the Tour de France offers a mix of terrains and tests. This year’s edition contains seven flat stages, five hilly stages, six mountain stages with four summit finishes, as well as time trials. To come out at the head of the pack takes an athlete with an optimal mix of qualities and characteristics – including the right type of muscles.